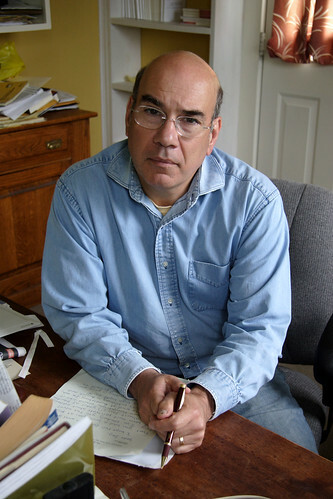 Jay Parini is a poet, novelist, and critic. He has edited numerous anthologies, authored four books of poetry, several biographies, including, John Steinbeck (1995), and One Matchless Time: A Life of William Faulkner (2004), a collection of essays, Some Necessary Angels: Essays on Literature and Politics (1997), two volumes of criticism, Why Poetry Matters (2008) and Promised Land: Thirteen Books that Changed America (2008) and seven novels, including Benjamin’s Crossing (1996), The Apprentice Lover (2002), The Passages of H.M. (2010) and The Last Station: A Novel of Tolstoy’s Last Year (1990). In 2009, The Last Station was made into a critically acclaimed film starring Helen Mirren, James McAvoy and Christopher Plummer. Parini’s writing appears regularly in The Chronicle of Higher Education and The Guardian (UK). He co-founded the New England Review in 1976 and was appointed literary executor for Gore Vidal in 1995. He earned his B.A. from Lafayette College and his Ph.D. from the University of St. Andrews. He has taught English and creative writing at Middlebury College since 1982. When did you realize that you wanted to be a writer? I was in Scotland on my junior year abroad, and I was reading T.S. Eliot, and I had an overwhelming sense that I wanted to write my own poems, and that whatever I did I must devote myself to poetry as a writer as well as a reader. My interest in prose soon followed. I had thought I would go to law school, even though it seemed boring. Reading Eliot, I was so excited that I thought: there must be some way to do this. I couldn’t imagine what it might be. I looked around and saw these young teachers at the university, and it struck me that if I did that, I could find time to write. I was not wrong! Were you writing poetry in college? I was writing poems in college from the beginning but they were terrible, and I knew it, too. But I liked doing it, and I thought that I’d get better if I read more poetry and thought about it longer, and I did that. I read a lot of critical work on poets, too: I.A. Richards, Cleanth Brooks, Eliot’s essays, that sort of thing. I consider myself “self-taught.” I was in various schools for long years; but anything I learned that was useful was mostly learned by myself on my own. I don’t think anyone can teach anyone very much in a deep way. Self-taught is the only way. Do you work differently when you are writing poetry as opposed to fiction or nonfiction? Yes. I write poems slowly in longhand and I even revise in longhand. I think the physical contact with the page is absolutely essential. I could not physically write a poem on a laptop or typewriter board. It’s a long time before I really get to typing up a poem. Then I do more revisions by longhand. I often let the poems sit for years in my notebook before I go back to them. That gives me the time I need to see what was wrong, what needs revision. How did you go about pursuing your early career as a writer? I began by writing book reviews for Scottish publications, as I was a graduate student in Scotland. I sent poems to little magazines. My first publication was in a tiny Edinburgh magazine. It took a while to get any larger outlets to consider my work but eventually that happened. I published a little collection of poems at the age of twenty-four with a local Scottish publisher— very limited edition, but it felt really good to see those poems in print. What about challenges you experienced along the way, especially in your early years? I remember being really scared in grad school, knowing that the job market for college teaching had pretty much dissolved. I remember writing to Dartmouth about a job that was advertised. They had over a thousand applicants for two jobs. I had never been in the so-called Ivy League. I was a grad student in a remote university in Scotland. I had a book of poems from a tiny Scottish press. It seemed impossible that I would get anywhere. I was truly and genuinely and for good reasons terrified. But things worked out. It was a combination of persistence, certain personality traits— a sense of humor – and perhaps some real ability as a writer and teacher that saw me through that difficult time. What about some early triumphs? When I moved back to the USA [from Scotland] in 1975, I knew I had a task before me: to find American outlets. I began to write reviews for such magazines as Poetry and to write for small magazines, such as Antaeus. I had some luck with national magazines taking poems in the later 1970s: The New Yorker and The Atlantic took poems. Others soon followed. Then – a real coup – Random House accepted a book of poems, Anthracite Country, which came out in 1982. I was also writing prose, and my Ph.D. thesis was rewritten and published by a small university press in 1979 – my first “real” book, in fact. I wrote a novel called The Love Run that was taken by Atlantic-Little Brown and published in 1980. With those three books, I had established a pattern of sorts, moving from poems and prose, from fiction to criticism. Do you recall the feeling you had when you saw your first poem in print? Well, I loved seeing my first two poems in print in small Scottish journals: Umbrella and Scottish International, both defunct long ago. But there was a great moment when, in the space of a few weeks, I had poems taken by The New Yorker, The Atlantic, and Poetry. That was an exhilarating moment! What kinds of jobs did you have before you were able to support yourself on your writing? I have always had a teaching job somewhere to support my writing habit! I started teaching in St. Andrews, Scotland, as a grad student. My first full-time job was at Dartmouth. I was damn lucky to get that job. Did you ever seriously consider other professions? I really never thought of doing anything but teaching and writing. It always seems like a very useful combination of activities, with the teaching enlivened by the writing and vice versa. I was lucky to get jobs in difficult markets. I never for a second don’t appreciate that and even wonder that I was able to get jobs in good colleges. How did your family feel about you pursuing a career as a writer? My parents thought I should go to law school. They felt better about me when I got a teaching job! What was life like for you back in the salad days? Well, I’m not sure what were my salad days. Probably the years of teaching at Dartmouth: 1975-1982. My salary at Dartmouth was ten thousand a year. My apartment— I lived in a small apartment alone in Hanover— cost me $350 a month. I lived very inexpensively. I ate a lot of soup from cans. Spaghetti, and chicken, over which I dumped a can of mushroom soup. I didn’t buy many clothes. I rarely went to the movies. I liked to work, and I did. I would get up at eight and go to a diner, where I’d begin writing poems while I drank coffee. I started writing novels and book reviews in a serious way as well. I had, in a sense, been behaving in the same way during grad school, always writing poems first thing. I wrote a novel— never published— in grad school. So I developed a habit of writing every morning and teaching in the afternoons. That pattern locked in place, and it has never really changed. Habit is everything for a writer. Tell me more about your work habits. I still write every morning and teach in the afternoons. I write on weekends when I can, but I make sure to take an hour to exercise: I play basketball three days a week at noon. I go for long walks in the woods two or three days a week. Was there ever a time when you wanted to give up on writing? I never wanted not to write. Never once. I love it. I need to do it. It gives me a huge feeling of contact with the world to write about it. I think I would get lost in space without writing. I’m a bit dreamy, self-enclosed at times. I need writing to look hard at my own experience, and to see what others are really doing. Perhaps I’m way too self-enclosed at times still. It’s not good. Do you think of your work differently now that you know it will be published and find an audience? No, not really. I always worry about finding a publisher, or the right publisher, for my work. And it’s difficult to find readers. Very difficult. I think it’s as hard now for me as it ever was. You write across form, everything from poetry to fiction to essays and criticism. Is there a particular form or style that you identify most with? I suspect that for many years I thought of myself as a poet who wrote prose on the side, but really the prose has moved toward the center. I write poems still— never are they far from my mind. But the prose is time-consuming, especially long prose novels and biographies, which take a lot of hours. A lot of writers seem to have a sour attitude toward academia and academic writing. You do both. Does your “creative” writing and your “academic” writing feed one another? I’m not sour on the academic side of things. I don’t of course write traditional academic pieces or articles. I write reviews mostly, or biographies, or freer forms of criticism. I can’t imagine writing “scholarly” articles of the kind that get printed in the MLA or such journals. I’ve been there and done that; but I gave that kind of writing up about 25 years ago. Maybe 30 years ago! Your book, The Last Station, was made into a film that was released in 2009. How does it feel to see your novel, in some form, on screen? A writer envisions a story: the setting, the characters and plot, the dynamics that unfold among the various characters. But a novel is all about the language – a purely linguistic medium. Film is another thing, and it’s not especially my thing. A movie runs for roughly two hours; a novel runs in the head, on the page, in a timeless zone. Fiction is rarely linear; my novel certain isn’t. Yet a film is by definition tied to frames that flicker in time, from beginning to end. The process of adaptation involves endless (and ruthless) selection. You take out everything you can, trying to film just those pieces of the story that seem essential, that cannot be removed without doing severe damage to the story itself. The Last Station, as a film, seems wonderfully to mirror the tone of my book, with its combination of tragedy and comedy. Who would guess you could make an amusing film about the death of a great Russian novelist? That’s not exactly what Mike Hoffman did, but it’s not far off. There is plenty of tragedy, but there is also marvelous light entertainment as well. Few novelists seem to like what filmmakers make of their books, but I’m the exception here. I like the film a great deal. You have been teaching writing and literary studies for some time. If you could choose only one lesson to tell your students, what would it be? I would tell students not to abandon their vision. To keep a steady eye, a steady hand, and not think about the world’s opinion. Keep your own counsel and trust your vision. Roethke said it well: “Summon a vision and declare it pure.” I would go with that. Any general advice for young writers just starting out? I think you need a day-job, but it should not totally consume you. If you don’t teach, you should just get any job that pays the bills and gives you the emotional and physical energy to spend two or three hours writing. Find time to write every single day. Write at least a page of something every day. This entry was posted in Writers and tagged "Benjamin's Crossing", "John Steinbeck", "New England Review", "One Matchless Time: A Life of William Faulkner", "Promised Land: Thirteen Books that Changed America", "Some Necessary Angels: Essays on Literature and Politics", "The Apprentice Lover", "The Chronicle of Higher Education", "The Guardian", "The Last Station: A Novel of Tolstoy's Last Year", "The Last Station", "The Passages of H.M.", "Why Poetry Matters", Astri von Arbin Ahlander, Jay Parini, Middlebury College. Bookmark the permalink.